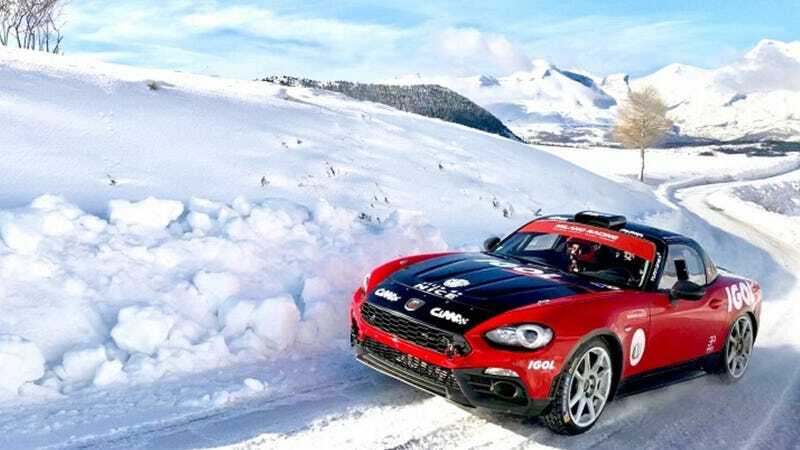 Not a single sports car finished this year’s Rallye Monte Carlo, which is a bummer. Sports cars belong in rallying. Now, it’s not that no sports cars entered the Monte. Two 124 Abarths entered under the R-GT class, but neither of them finished the event, their failures being listed as “turbo” and “electrical” by eWRC. But this isn’t entirely the fault of the little 124s that no sports cars finished the rally. They should not have been alone in their entry anyway. We’ve seen Porsches run the event before, and we should see tons more little sports cars tearing through the paved and unpaved roads of the World Rally Championship calendar. Astons! We should be overwhelmed with plentiful Aston Martins. If you doubt me, watch this old news clip of French rally legend Jean Ragnotti tearing through some mountain pass in a Renault Sport Spider. Midengined, rear-wheel drive, it should be as bad as a car can be at rally, but it’s not. It’s a joy and, as you can see in the vid, absolutely beloved by everyone standing beside the road. I can only implore you, the sports car drivers of the world, to enter as many rallies as you possibly can. It’s for the greater good.